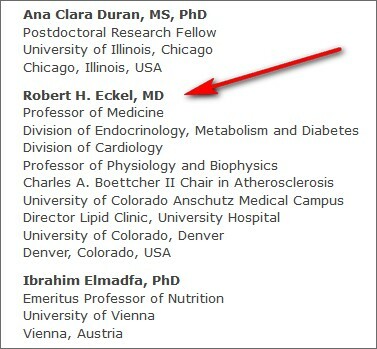 UPDATE, 12/18/15, 4:22pm ET: The Center for Science in the Public Interest has deleted University of Colorado professor and former American Heart Association president Robert Eckel MD as a signatory on a letter to the British Medical Journal requesting that an article by journalist/author Nina Teicholz be retracted. Below the hash marks is my original item in which Dr. Eckel and the University of Colorado legal counsel stated that he chose to remove his name because I filed a public records request. Since I reported that item, the university completed my records request. In the near future, I plan to report about what turned up. 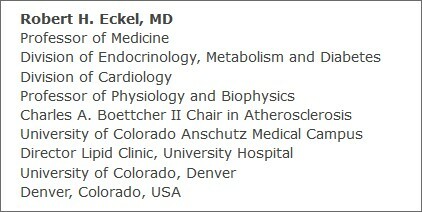 Robert H. Eckel MD, a long-time faculty member at the University of Colorado and former president of the American Heart Association, is removing his name from a letter to the BMJ (formerly the British Medical Journal) that was signed by more "than 180 prominent cardiovascular and nutrition scientists from 19 countries." 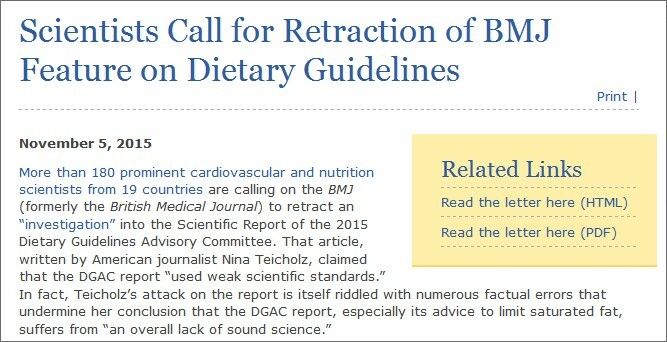 The letter, which was organized by the Center for Science in the Public Interest (CSPI), a Washington, DC advocacy nonprofit, urged the BMJ to retract The scientific report guiding the US dietary guidelines: is it scientific?, a September 23, 2015 article by New York City journalist/author Nina Teicholz. 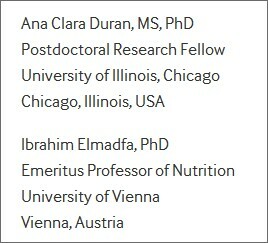 Before I get to why Dr. Eckel says he chose to remove his name from the letter, have you ever heard of the U.S. Dietary Guidelines or the Dietary Guidelines Advisory Committee (DGAC)? I hadn't until recently when they were brought to my attention by Yale professor/author/columnist Dr. David L. Katz. I was reporting a story about an Amazon book review and two Huffington Post columns in which Dr. Katz praised a novel called reVision without disclosing he wrote it under a pseudonym. (reVision) is not at all the relevant story here. As I wrote to Dr. Katz, that sounded like an interesting story I might wish to report. 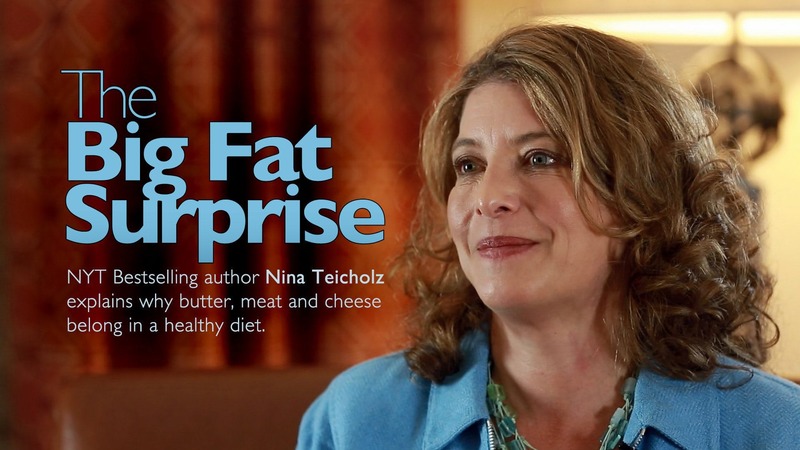 Per this CSPI press release, on November 5 the story got even more interesting. I'd never heard of an attempt by scores of credentialed professionals -- including Dr. Katz -- to urge a medical journal to retract an article by a journalist, so I wanted to learn more. Click here for the letter and you'll see that a few dozen of the co-signers work at public institutions. I was curious to learn why Dr. Eckel decided to remove his name from the letter, so last night I asked him. To my surprise, in a series of back and forth e-mails -- see below and click here to download -- he explained that it had to do with my records request and that the university informed him he may face "criminal actions." I was out of town and that's what the University legal office voice mail message indicated if I didn't respond [to your records request] by a certain date. When I finally reached them my decision was to withdraw my name. I'm not positive, but Dr. Eckel may be under the impression that removing his name from the CSPI letter terminates the university's obligation to complete my records request. In any event, I've instructed the university to complete my request and I'll report the results.